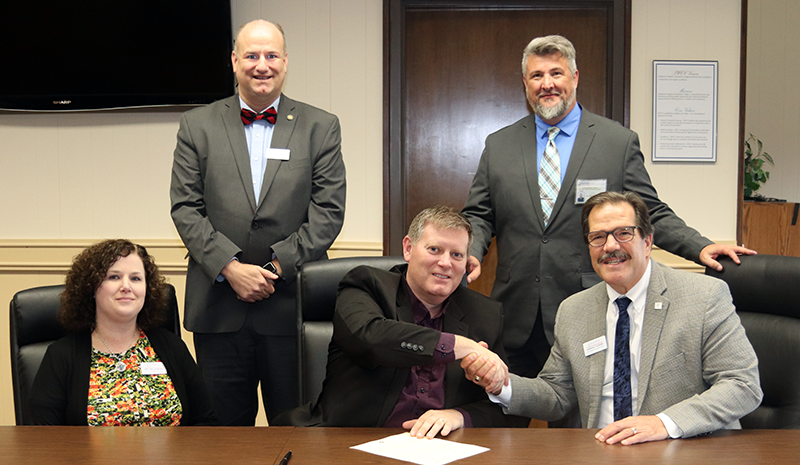 Pictured are officials from Southwest Virginia Community College and Bluefield College signing a Memorandum of Understanding for the Return to Roots Teaching Initiative. This new program will recruit and assist students who would like to teach in the region. Front row, left to right: Mrs. Shellie Brown, director of Teacher Education and assistant professor, Bluefield College, School of Education; Dr. Tommy F. Wright, president of SWCC; Dr. Marshall Flowers, vice president for Academic Affairs and Athletics, Bluefield College. Back row: Dr. Thomas Brewster, dean and associate professor, Bluefield College’s School of Education and Dr. Brian Wright, interim dean, Humanities and Social Sciences Division, SWCC. Bluefield College and Southwest Virginia Community College (SWCC) are partnering with local school divisions to recruit and assist students who would like to teach in the region. Students who are admitted to the Return to Roots (RTR) Teaching Initiative will complete two years of coursework at SWCC, while also taking selected classes at Bluefield College. Upon graduation from SWCC, the remaining coursework will be taken at Bluefield College. All four years of the Return to Roots Teaching Initiative will use defined pathways of instruction to ensure that all students are on track for graduation at the end of four years. “Bluefield College School of Education and Social Sciences is excited to partner with Southwest Virginia Community College as part of our Back to Roots Initiative. Our goal is to help future educators train local and stay local by training them at SWCC and Bluefield College and by helping them find employment opportunities within their local school districts,” said Shellie Brown, director of Teacher Education and assistant professor, BC’s School of Education.